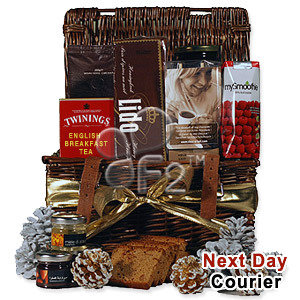 Info: This gift basket combines a generous assortment of fine gourmet with a look that conveys your good taste. Great to send for any special occasion. Basket is loaded with Twinnings English Breakfast tea, New Tree chocolate spread, Oxfam Africa world coffee, gingerbread with honey, raspberry, Choc-O-Lait, jams and acacia honey.